Yesterday was Retreat Day at school. Each year, the pastor plans a team-building activity for the staff. Last year, they went to a different church and had a prayer retreat. This year, the pastor wanted to do something different. We got divided into three teams, and were tasked with the job of making candy. We were given chocolate chips, and $7.50 to spend at a Korean grocery store nearby. After cooking in the kitchen at school, we had to go into the community and have some stranger do a taste-test and choose their favorite. It was a lot of fun. The candies were tasty. My group didn’t win, but I did get to know them better, and we got to eat such delicious sweets. Unfortunately, I forgot to take a picture of any of the proceedings. Instead, I’ll post a picture of my classroom bulletin board. Before the day started yesterday, I finished stapling everything up. The theme verse for the year is 1 John 4:16. I decided to go with a simple design. This entry was posted in Bulletin Boards. Bookmark the permalink. It was a delight to my eyes and to my heart to see your “translation” of the school verse for this year. Students will have that simple and powerful graphic to look at all year! Awesome! Now that’s my kind of retreat! What fun! 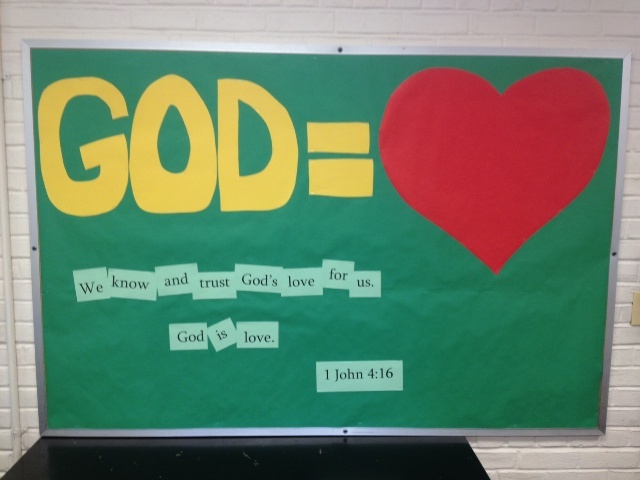 And as always, nice bulletin board! Love the colors. Our group found some rolled-up waffle cookie type things. We grated orange peels, mixed them into vanilla cake frosting, piped it into the cookies, and dipped the ends in chocolate. We called them “orange faux cannolis”. Another group mixed marshmallows into their melted chocolate, which caused it to seize up. They rolled the mixture into a ball with peanuts and marshmallow pieces. They called them “goofballs”. Another group topped a Ritz cracker with peanut butter, coconut, chocolate and a Whopper. They called them “office delights”, because they were all office staff. The office delights won, and not without reason. They were tasty. Excellent! What a fun activity! Sniff – I miss your bulletin boards. Maybe I can channel you when I toss together a chapel missions one for the hallway outside my room again this year. It always needs more “oomph” than I give it. Send me some oomph when you can, ok?